Two days before his birthday on 12th June Trump will be the first US leader to meet a NK supremo – if all goes to plan. Kim’s leadership chart will still be in a discouraging dip from tr Saturn conjunct the Sun Pluto. Though tr Uranus has been boosting the Jupiter from mid May. They are miles apart on what denuclearization means. For Trump: it’s ditch the lot; for Kim: it’s stop missile testing while keeping his security blanket intact, with an eye on what happened to Libya’s Gaddafi when he gave up the nukes. 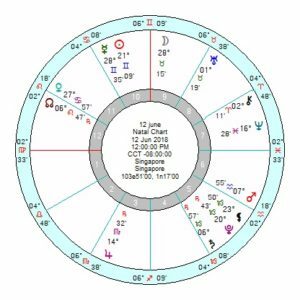 There’s nothing too informative astrologically on June 12 though there’s a slippery Sun square Neptune and inconjunct Pluto – so no doubt much tap dancing going on both sides. But likely no concrete outcome. 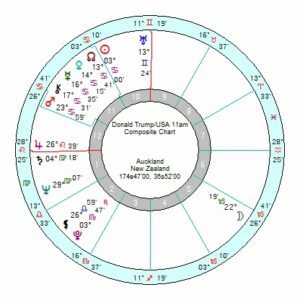 Trump’s personal chart has nothing of note on transits, odd blips on midpoints and the high-drama Solar Arc Uranus conjunct his Mars. It’s been pointed out that he does have his Progressed Venus conjunct his Jupiter in effect now and over the meet and beyond for a few weeks/months. At best this indicates peace and harmony, popularity, honours, and being invited into a prestigious social group. But it’s a combination that has a downside. Often associated with the fashion business, it has that all-for-show, superficial charm, more style than substance feel. Super-indulgent, it stimulates a need for pleasure, for more, more more. It can lead to film-star mannerisms and over-promising. Where his problems really pick up are from mid February 2019 to late 2020 – with first tr Pluto opposition his Mars/Uranus – violent interventions, test of nerve, struggle for survival. Then from late March tr Pluto opposition his Saturn which is an uphill struggle and opposition his Mars/Node usually involving a violent separation. Those three run till early July, and repeat on and off thereafter through across the following year. And from 2019 till late 2020 he has tr Pluto opposition Sun/Mars, Mercury/Pluto and Venus/Saturn – which is a whole load of grief – enormous strain, enraged, frustrated, under considerable mental pressure, lonely, can be violent. 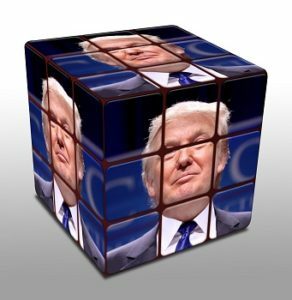 From April 2019 onwards as well he has tr Neptune square his 10th house Uranus, which will make him highly-strung, confused, clinging onto not always rational ideas with fanatical fervour. His Solar Return from June 2019 to June 2020 has Saturn Pluto (10th) opposition Mars Mercury (4th). Plus a ‘false happiness’ Sun Jupiter Neptune. 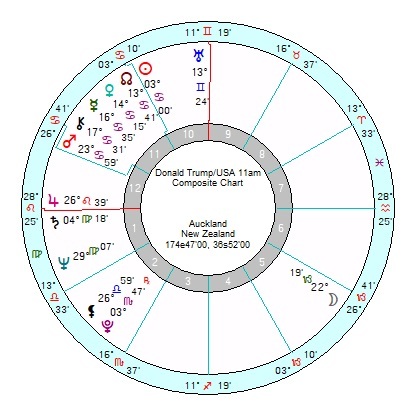 His relationship chart with the USA starts to show real aggravation from March 2019 to late 2020 with tr Pluto opposition the composite Mars; as well as major upheavals and disruptions in 2019 from tr Uranus opposition the Pluto. Part of the above could conceivably be because of actual violence either on the streets or in military action abroad. The likelihood is that 2019 will see a global recession because of the Saturn Pluto conjunction in Capricorn, perhaps triggered in part by rising oil prices with trouble in the ME; and the USA chart has the discouraging tr Saturn opposition Sun then; as well as tr Pluto starting to oppose the US Mercury for angst-ridden and bitter debates. Marjorie, could you clarify what you mean when you say transiting Pluto will be opposite his Mars/Uranus? His Mars is in Leo and Uranus is in Gemini. I am missing something, thanks. Mars/Uranus is the midpoint between the two so is in late Cancer. Interesting piece in Psych Today on why narcissists thrive on chaos. The descriptions of the traits and the people remind me of past managers. Always changing priorities at the 11th hour, then calling the customer to “fall on his sword” for late deliveries and missed commitments. Verbally abusing colleagues because “they are not up to the challenge”. Grand gestures don;t pay the bills. One manager was totally out to lunch. He had married a ballerina – because he thought it would be nice to have a pretty face in the house. He was hired as a manager – then bought a BMW to impress his mgmt. Conducted staff meetings…not in English but in Spanish because it was easier for him. He’d ignore the Americans in the group…while forming a close inclusive conclave with the other Spanish-speaking engineers. This didn’t go over well with HR Legal. I eventually resigned while others transferred out of the group and filed complaints of “ethnic exclusivity”. He was fired a few months after I quit…and even when being walked out the door, this person was shouting that it was someone else’s fault. I’d love to see the Spanish Inquisition skit integrated with Trump et al. 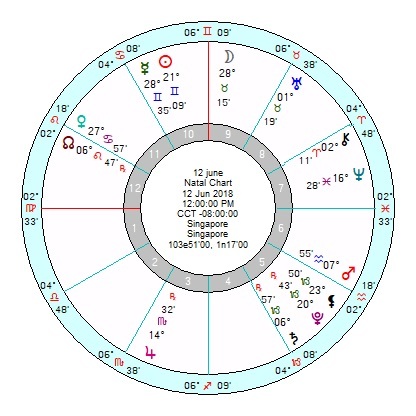 Another astrologer pointed out Trump’s progressed Venus will conjunct his natal Jupiter (exact on June 14) with a fast moving progressed Moon following a sextile to both his natal Jupiter and progressed Venus in early August. If this is true, how would this effect the equation. I’m wondering if that progressed Venus conjunct his Jupiter will lead to some reckless behavior or an unexpected success. There must be some explanation for some of this crazy and undeserved luck he’s been enjoying lately. In his personal chart I know this would all be happening in his second house, but wondered if this could effect the bigger picture with his meeting with Kim Jong Un. I must admit it’s not something that would have leapt out at me. Venus Jupiter always feels like a meringue, sugary sweet and frothy. All superficial coochy cooing. If his birth time is accurate and he hadn’t been POTUS I’d have said he’d go in for a massive spending spree and throw the most extravagant party ever, all glitter and ostentation. Venus being Aphrodite, goddess of flash parties and over-indulgence; and Jupiterian Zeus needing to have the hugest of everything. Ebertin describes it as being associated with the adrenals or other glandular systems. When I had Solar Arc Jupiter conjunct my Venus, I went down with some odd glandular/fever ME type thing. It may be the NK peace deal since Venus loathes unpleasantness of any sort and wants to smooth over difference. But it’s ways too weak to forge a solid deal. Might explain his surge in popularity. Be interesting to wait, watch and fillet events to see which fits. Thank you for the interesting timeline. Could all the predictive angst be indicative of him leaving, or being removed from, office?